Senior Emily Dunn dribbles the ball into the midfield as a defender approaches. Dunn scored the final goal in the Tigers' 3-0 shutout against the Maranatha Minutemen. 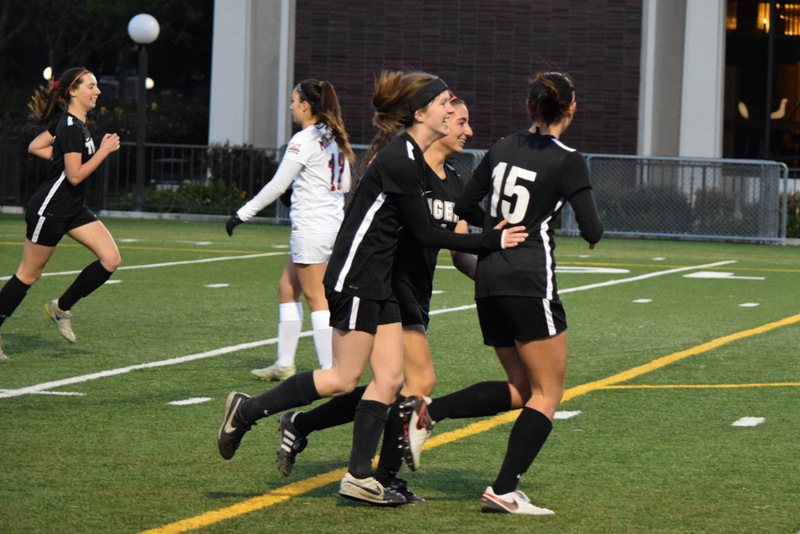 The girls’ varsity soccer team struck yet again with a 3-0 shutout triumph over the Maranatha Minutemen at an away CIF Southern Section Division V match on Tuesday, February 20. 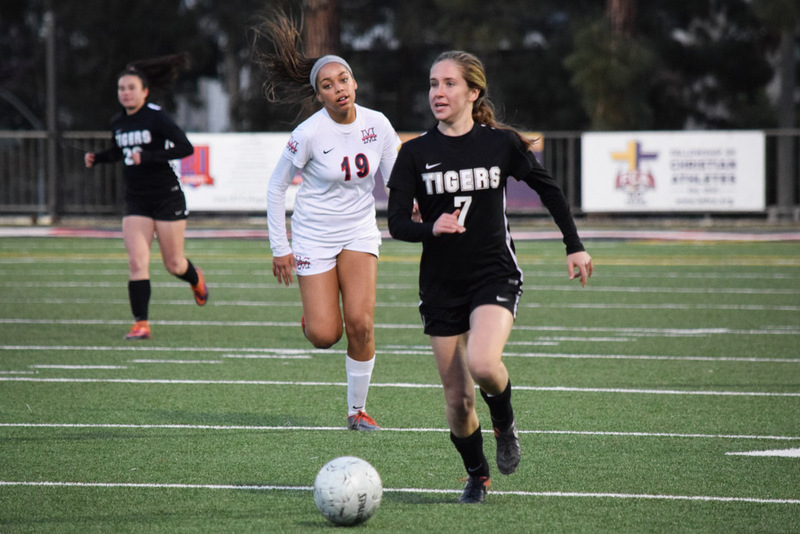 Differing greatly from their previous Glendale matchup, the Tigers practically waltzed in to secure the win– two early goals to the take the cake and one at the end as a cherry on top. The team situates itself as a CIF quarter-finalist and boosts its already-brilliant record to 18-3-2. If last Thursday’s game was the Tigers’ fierce battle for honor, then today’s game was the coronation ceremony for this historic team. Serving as the ultimate culmination of a season’s worth of mistakes and training, this match saw nearly flawless performances from every Tiger on the field. That said, South Pas’ midfielders were the indisputable luminaries of the game. Senior, junior, and sophomore Emily Dunn, Rainey Tilley, and Corey Segal dazzled: through effortless passes, fluent ball control, strong communication, each midfielder shines in their own way. 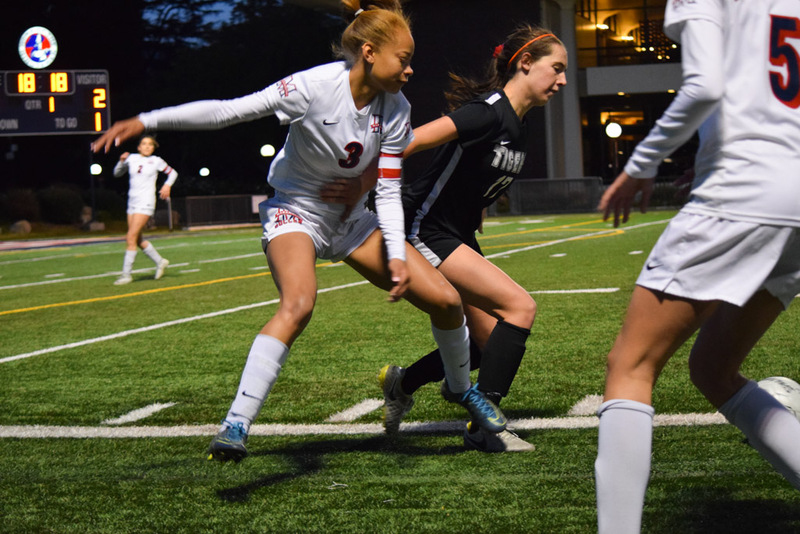 Segal exudes an unflappable poise that allows her to deny opposing attacks, calmly collect possession, and snap consistently accurate shots to teammates and to goal. Tilley acts as Segal’s ideal complement, emanating boundless vivacity as she sprints every which way to support her teammates. While the opposition may be scraping the edges of their endurance to make it through a game, Tilley somehow produces a miraculous energy in times of universal fatigue. To complete the trio, Dunn possesses an abundance of raw talent. Though superb in every arena a midfielder is expected to be, it is her beautiful kick (and throw-in) that proves her stardom. As a unit, the midfield left little work to be done for their teammates, with each of them responsible for one of the goals tacked onto South Pas’ record. Juniors Rainey Tilley and Jenna Noueihed celebrate with Sophomore Corey Segal after Segal’s crucial goal in the first half. Mere minutes into the first half, the Tigers were already throttling the Minutemen. Segal quickly discovered an opening, crossing the ball narrowly past the Maranatha goalkeeper and into the far right edge of the net. Following this initial success, South Pas fell into an unstoppable shooting rhythm. Senior and junior forwards Isabel Bluml and Uma Hornish only amplified an already capable frontline; Bluml herself possessed ingenious vision throughout the course of the game, setting up countless gorgeous scoring opportunities. And though these forwards would make a multitude of valiant efforts on goal, it was the midfielders who brought the game how. Not long after the first goal, Segal sent another well-aimed cross to Tilley, who cleanly headed the ball into the net. The half closed with South Pas confidently in the lead. Junior Uma Hornish battles against a Maranatha defender as she tries to reclaim the ball. Naturally, the Minutemen dove into the second half ravenous for a comeback. And while they managed to fend off another goal for most of the match, the Minutemen simply could not keep up with the South Pas team in its prime. If there was only one South Pas shortcoming in this match, it would be the fact that their lead should have been doubled, or even tripled. The second half brought about much more textbook opportunities on goal, nearly all of which were left uncompleted. Eventually, the Tigers’ dominance on the field was represented on the scoreboard, as Dunn acted as a finishing powerhouse. With three minutes left on the clock, Dunn followed up on a deflected throw-in with her first touch. The kick sent the ball flying perfectly from the far left field and straight to the back of the net, closing the match with a bang. Blasting through the second round of CIF, South Pas has clinched a quarterfinal spot. The team will be defending their soccer glory against the formidable Beaumont Cougars at home on Friday, February 23.